Aigital Bluetooth Car Kit Speakerphone Wireless AUTO Power ON Handsfree Visor Speaker, HD Audio Adapter for Hands-Free Calling Music GPS Navigation - White by Aigital at Atoz Car Rental. Hurry! Limited time offer. Offer valid only while supplies last. Aigital Bluetooth Car Kit coming with car charger and USB cord provides you a good and safe solution to calling or streaming music on the road. Aigital Bluetooth Car Kit coming with car charger and USB cord provides you a good and safe solution to calling or streaming music on the road. 7. HD quality calling sound for both you and the other end of the phone. If you have any questions, please feel free to contact with us so we could solve that for you soonest.  Auto Power On: Just clip the device on your sun visor simply. With Built-in Motion Sensor, it can Turn On Automatically by sensing car shocking when you get in car.--You will love this function.  High-Quality Audio: Bluetooth V4.1+EDR,designed for great sound with HD Voice,noise cancellation technology and stereo speaker--you can have clear calls and wonderful music even in downtown.  Safe Driving: This device provides you a safe driving solution. With this handsfree,when you need a call in driving, you are able to drive safely without bothering from earphones.--Your families are waiting for you home.  Intelligent Connection: Automatic working modes(Auto Connection,Auto Standby,Auto Power On,Auto Off) can save battery life;supports Apple Siri connection and is able to connect 2 bluetooth mobile phones simultaneously on working. 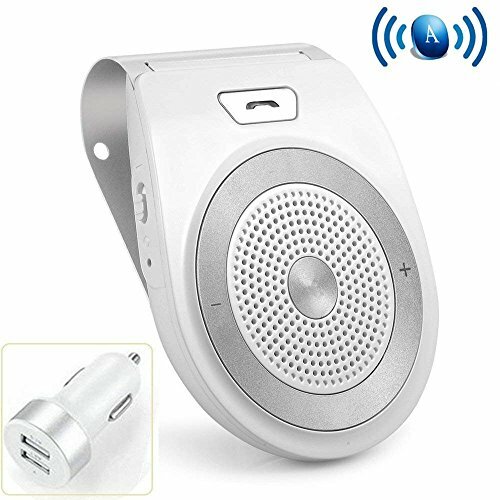  Value for Money: A great replacement for your car built-in bluetooth(If it's broken or there is no) to let you have hands-free callings and music.